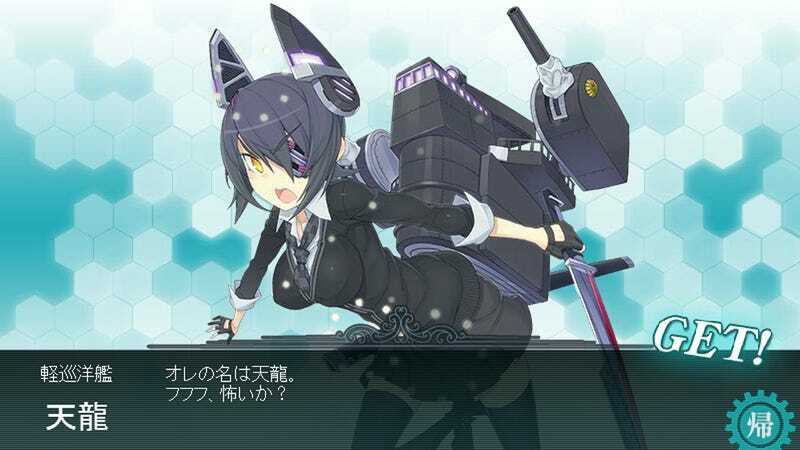 Honestly, it was the last game I thought I'd find myself hooked on, but Kantai Collection (艦隊これくしょん) or, as it's better known online, Kan Colle (艦これ), has me seeing warships as cute anime girls... I think I need to explain myself. Released this past April by DMM.com and Kadokawa Games, Kan Colle is a free to play "Next Generation Fleet Girls Tactical Browser Game" where you collect various ships, assemble fleets, and send them on missions to gain experience points. The twist is that all the ships aren't ships. They're "Fleet-Girls" or Kanmusu (艦むす): Anthropomorphic warships. By using real-life World War II ships as models for the Fleet Girls and cutesy anime-girl character designs, Kan Colle seemed to be playing on the fandoms of two types of Japanese geeks; the military otaku and anime otaku. It felt like pandering at first. But watching my friends on my private twitter feed starting to obsessively talk about the game one by one, I had to see what the hubbub was about. As it turns out, the game is far more engrossing than I had initially expected. Being a browser-based game where most of the combat is automated, I didn't think it would amount to much. But, it turns out, one of the game's biggest benefits is actually in much of its automation and how activities like building and repairing take real time to complete. It allows you to run the game in the background while you do other things and keeps you checking in every now and then for whatever manual micromanagement you want to do. It's the perfect game for anyone who finds themselves at a computer for long periods of time (i.e. almost everybody). Now, I find myself selecting my browser tab whenever I can to see if my second and third fleets have returned from their missions, being constantly irritated that my resources don't replenish fast enough. One of the main selling points of the game, the Fleet Girls, add to the game's appeal by being based on real-life World War II-era vessels. Every Fleet Girl has an individual bio where you can learn a little bit about the actual ship. The character designs give the ships personality and makes you interested in actually finding out more about the real ships' history. As I write this article, my Kongō class battleship and Shōhō class light aircraft carrier are undergoing repairs. It'll be another hour before I can send them back out to the high seas. Don't sink my anime girl battleship, game. Note: While it is never stated in the game, it may be worth noting that due to the nature of the era that the ships in the game come from, the enemies encountered – while depicted as almost alien – are most likely Allied forces.